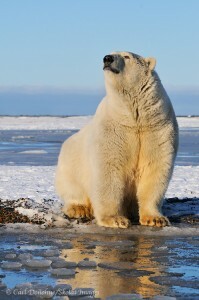 An adult polar bear sits on the shores of the Beaufort Sea, waiting for freezeup. Alaska. Please click on the image above to view a larger version of this photo. So, I’m sure by now you’re all familiar with the 101 ways to heighten your photography reputation and business prowess through the magic of social media. There are nearly as many blog posts and articles on the secret mojos to becoming a social media icon in the world of photography and art as there are, surprisingly, photographers and artists out there in social media-land. Typically, these articles repeat the same tired old cliches: engage, time your posts carefully, be consistent, etc, etc, etc. Here’s another take on this ‘phenomenon’ of social media. Recently I was in southeast Alaska photographing bald eagles. During that trip, I ran into 2 fellows from the BBC, filming for a wildlife documentary they’re making. Filming for another wildlife documentary they’re making. These guys have made several, and travel around the world filming for a company that makes some of the most amazing wildlife on the planet. The photographer, John Brown, also shoots stills (as well as video) and is represented by Getty images. Pretty cool gig. I mentioned to him about possibly doing an interview with him, if he’d be so kind as to give me some time; he did, and I enjoyed a great couple of hours chatting with the 2 of these guys about wildlife photography and filmmaking and all the stuff the rest of us merely dream of. I’ll edit that interview down in the near future and put together an article from it. During the course of the conversation, I don’t recall John mentioning social media once. Not once. He didn’t give me his twitter handle, or his facebook profile, or refer me to his G+ page. He mentioned his website, but the rest of the conversation was about his work; his photography and his art. Another friend of mine, Paul Souders, is a fantastic photographer. He has a facebook profile, which he very rarely posts to. His last post to the social site 500px was nearly a year ago. He’s returning, or just returned, from Antarctica. The guy shoots all over the world, and his work is ridiculously wonderful. Another friend of mine, Joni Tevis, is a writer. She has an essay coming out in the near future for Orion Magazine, and has a wonderful book, “The Wet Collection” published. Awesome, awesome writer. I’ve chatted with her several times about writing, making art, and getting it out there. She does have (barely) a Facebook page, but rarely posts to it. She’s not on Twitter, Google Plus, etc, etc. She writes. Another friend of mine, Shane Theriot, is a musician. A guitar player. He’s awesome; seriously, awesome. He’s played with various national and international acts, and worked for numerous well-known and “successful” artists. He has 2 nationally released CDs and is working on his fourth. Shane tweets about 5 times a year, and posts on facebook not much more frequently. The point here is that art isn’t about social media. It’s about art. Your photography isn’t about social media.Don’t grab for the mustard and forget about your sandwich. These working and uber-talented, wonderful artists, aren’t running up and down facebook/G+/Twitter telling the world how cool they are; they’re making art. Art which is then sold, read, listened to, viewed, etc, all over the world. They work with talented people, and they make great work. Social Media isn’t the key to what they do, and how much we like it. Their work is. Let’s keep it at least some semblance of real. This entry was posted in Alaska, Art, Photo business, Photography, Polar Bears, Social Media, Wildlife and tagged facebook, photographers, Polar bears, Social Media, twitter, Ursus maritimus on December 13, 2012 by Carl D.
So I found this thought provoking as usual post from your link on FB. ;-). Hope all is well man. Carl, This is the best post on social media for photographers I’ve read all year. LOL. Carr Clifton keeps giving me a hard time for being on Twitter and even blogging. He says social media is a waste of time. I notice that most of the best known photographers don’t mess around with social media at all. For example, how many of the iLCP pros are on social media? What if all the social media pundits are WRONG? What if it is just a useless FAD? If I get one or two buyers a year from hundreds of hours invested in social media, how does that compare to hundreds of hours directly invested in selling prints? I don’t personally write it off completely. Being on Twitter has just about doubled my traffic on my blog. However, can I eat traffic? Put traffic in my gas tank? Use traffic to buy an airplane ticket? Traffic is useless. Only the right traffic is of significance. We’ll see. The jury is still out, but I am beginning to have my doubts for certain. I wouldn’t say, or didn’t intend to say, it’s “useless”. Certainly for some people, social media has been an incredible boon to their work. My points are (a) that there are really an awful lot of artists out there who don’t use it at all, and (b) most people really don’t benefit from it much at all. I’d consider it like any pyramid scheme; there’s room at the top for a very few people, who do very well from it, while everyone else in the program below scurries around and effectively supports them. All the while a whole bunch of other people quietly head off to work every morning and successfully pay their bills. Great post, Carl. Shows that there is no one right way to go about it these days. Social media can work for some and is certainly something everyone should investigate so you at least know what it is but it doesn’t mean it is necessarily right for everyone. Ha! Good point! But I am earmarking someday when I may be able photograph polar bears and I hear there is this guy that leads a pretty awesome trip up there. Excellent read Carl. Facebook seems to just be another addictive drug for many people, ruling their lives. Your post reveals the truth – social media can be constructive as long as you use it as a tool and choose not to be a slave to it. Interesting post, glad I clicked on the Twitter link and got here to read it and I don’t think it was a waste of time. I think the point that most well known artist or photographers in this case don’t use social media is an answer into itself. Do they not use it because they are well known or are they well know because they don’t use it. Obviously they are well know because they have been around awhile and used other tools to get that way. Maybe social gatherings such as public showings and other type of media such as interviews on radio or in magazines. My personal opinion is that today’s social media is as good as one makes it. If you waste a lot of time there it will naturally become a waste of time. If one learns to use these tools they can become tremendously beneficial not only for the artist but for society in general. I’m kinda glad to hear that many artist don’t use social media and consider it a waste of time. That can only mean there is more space for those who chose to use it and learn to benefit from it. I will say that wading through the jungle of good and bad information these days can be frustrating and time consuming but when you finally find things that are useful or have taken the time to learn from it it seems to have been worth it. And no question it has to be about the art, but I have always believed art is for sharing and today we can share it with the world with one simple click. As skeptical as I am about social media’s effectiveness for the full-time professional, I acknowledge it is a fun way to share images and I have heard too many stories of multiple print and stock sales to write it off completely. At the same time, I don’t feel that the common argument holds water that the reason those who are “famous” don’t use social media is that they are already well-known, or that they “arrived” before the age of social media. That just further proves they didn’t need social media to become well-known. It doesn’t make a case that nowadays, in this so-different world, one needs social media to make it to the top. Someone said somewhere that the main reason they are successful is that they didn’t get sidetracked, but rather, they stayed focused on their art, which as I understand it is Carl’s main point anyway, not that social media is completely useless. Carl, great post. I’ve followed your blog for a while but this is the first time I’ve commented. You’ve touched on a really key issue, and I’ve tuned in because it addresses an area that I’m really passionate about. I’ve worked in online marketing for most of my career and absolutely believe that photographers can derive value from social media. My basic observation about photographers and social media is that many — most, perhaps — use it as though it’s a one-way push medium. However, this well-established advertising paradigm just doesn’t work in social media (I recently wrote about this here). You used the abused but nonetheless accurate word “engage”. Social media is a place where the notion of engagement works simply because it isn’t a one-way paradigm. Brad, in his comment, described a really critical element to “engagement”, and that’s information. When you find a social media source that consistently provides good information (whatever good means for you), you grow to trust it. Once you find this source, whether you “engage” or not is determined by your objectives for using social media, but engagement is largely predicated on the presence of trust. Trust simply isn’t engendered by a one-way dialogue. This monologue accomplishes the opposite, in fact — it’s tuned out. There are exceptions, of course. Photographers who were social media’s early adopters and who have built pretty large audiences get away with monologuing (a pet theory of mine is that a lot of photographers learn the bad behavior they exhibit in social media from these few individuals with wide reach). There also are rockstar photogs whom people follow because of their incredible images and/or who, in terms of income from photos, have done really well. I’m sure many more exceptions exist, and as you point out, social media just isn’t for everyone. I also want to acknowledge another really important reality that you touch upon: social media isn’t the point. Social media is in fact a means to an end. This is one reason why pollutants like Klout are just so…stupid. Social media great for finding information. It’s great for curation. It’s great for ‘keeping in touch’. And it’s a component, if you choose, of a broader online marketing plan that, when prescriptive and measurable, absolutely can deliver results. There are many, many success stories that prove social media to be more than a fad and the opposite of a waste of time. Whether or not “success” is attained is entirely in the details, though. David, you know I’m a fan of your conservation work so if you ever want to chat about your objectives as they relate to social media, your blog, etc., DM me on Twitter 🙂 or get in touch the old fashioned way and shoot me an email. Carl, thanks a lot for the thought-provoking post. Great post, Carl. Great post! I’m just as guilty as many about spending far too much time on social media sites. This is a great reminder that ‘success’ has more than one path leading to it. As an aside, there are an awful lot of ‘professional photographers’ that should consider changing career titles to ‘professional social media marketers’. Again, a great reminder that I need to heed. Haha good point, David (Taylor). It’s all about spin. “Professional photographer” sounds a lot sexier than photo educator or social media marketer. Thanks for the offer. I definitely will enjoy speaking with you on these subjects. So far the only social media I have had time for is Twitter. Before I even launched my blog, I studied blogging, read the books, etc. Same for social media. I understand the concepts of giving first and dialog and so on as taught by all the social media pundits. I have read the best books on the subjects and studied the ins and outs of it quite a bit before engaging. I feel I’ve done a good job of contribution. You can look at my Twitter and blog feeds, as well as my commenting practices and judge for yourself. Right now I happen to have a fundraiser and two sales as the three top blog posts, so that isn’t a very good example, but generally, I have given away a tremendous amount of very valuable and previously top selling and high profile writings of mine and my father’s for free. At this point, just to play “devil’s advocate,” I would like to ask two questions in this regard: 1. For every story like the guy who offered his unsold novel free, received millions of downloads and then came out with a paper version that sold tremendously well, for every one of those stories, are there not, many more stories of people who gave away free e-books and other free products and never received much of anything? 2. Is it possible that the reason most of the social media pundits recommend to everyone to give everything away free to start with is that they are in the business of getting everyone else on the web and getting everyone caught up in the marketing game that they are profiting on more than those who are playing the game on either end? My experience in life and in 25 years in various businesses is that the people who want things for free are the LEAST likely to ever buy anything and that those who you give to the most appreciate it the least. Lest you dismiss me as just a hardened and inflexible sales guy stuck in the old school model, I was involved in one company that was the first to implement on a large scale the “puppy dog” sales approach of letting people try the product free before buying it and I’ve participated in numerous marketing campaigns that involved giving away products or offering loss leaders to customers to get their interest before asking them to buy. I also find that on Twitter, Facebook and other social media a great deal of time and energy is spent on people trying to act as though they don’t want people to buy and wouldn’t ask them to buy anything unless the customer begs. One of my experiences in sales that I learned a great deal from was when I formed a quasi-partnership with the #1 spa dealer in Northern California to sell a product I introduced to the area. The owner of the spa store had trained his sales people to ask them to buy immediately on first contact. I believe that his upfront approach was one of the reasons he was #1. His approach went like this: “Hi, my name is Jeff. I own the #1 spa store in Northern California. Want to buy a spa?” All his salespeople used this introduction at parties and everywhere they went. I mean, who is going to say “No”? I want to buy a spa. Who wouldn’t? Who doesn’t? I want to say first that my offer was based solely on your comment regarding the value of social media, not on anything I’ve observed about your blog or interactions in social media (both of which I really enjoy). #1 I’m sure many examples of giveaways gone wrong exist. Two things about this. Giving stuff away is not a boilerplate online marketing strategy. There’s no single approach to social media that works for everyone. Social media has tenets that time has defined as valid. Cliched terms that they are, “engage” and “value” are two of them. Social media is a way to engage online, and there is usually a perceived value for doing so before this occurs. Which brings me to my second point. Understanding why one effort fails as another succeeds needs to be examined case by case. For sure, there are many more ways to fail at online marketing than there are to succeed. Among the most reliable is failing to develop a well-informed understanding of customers. To put a finer point on this, giving stuff away as a means to an end works only when people want or need what you’re selling. I can’t speak to #2 other than to say that every industry has its snake oil salesmen. Photography and social media are no exceptions. Regarding the latter, I’m comfortable agreeing with your statement to the extent that we all should ignore anyone pitching a one-size-fits-all formula for social media success. I think you’re right about people who want things for free. But with regard to online marketing, there’s utility in those people, too. If they like you, like what you say, like what you provide, they’ll help spread the word. All those freeloaders have voices, and sometimes all you need to do is ask and suddenly they’re working on your behalf. Lets say that for every 100 of those voices, there’s someone willing to buy from you. And to get to that one person, you gave away something for free that was truly valuable to many, in the process creating an audience for what you do. That seems like a good model to me. Regarding Jeff the spa dealer, something I’ve learned is that sales is a numbers game. How many times did Jeff ask that question before getting an honest yes? His approach is a brilliant qualifier. By going right at it he wasted no more time on people who weren’t ready to buy than it took to ask the question. He moved right on whenever he got a “no”, over and again until he got a “yes”. Smart. My point is that Jeff found the right people by asking the question. This is similar to what I described above about knowing your customer. The very first step to developing a marketing strategy (after objectives have been defined) is to build an understanding of customer needs, wants and desires. Usually, we do this by talking to customers, but the notion here is that you must understand the customer to effectively sell to her or develop something – a blog, an eBook, a video, whatever — that she’s going to “buy”. Thanks Wesley. Much of what you mention are marketing basics, but that is what works in any campaign on or offline…and what I sometimes need reminding about. Let’s talk further in another venue. Absolutely. Certain fundamentals are often overlooked or otherwise, simply skipped thanks to the fact that jumping into social media is as easy as setting up an account. Great post, Carl. Let’s not lose sight of the art. The social media is but one way to spread the word about it, and to get to know other artists. Thanks for a great bunch of comments and discussion. I guess my point is simply that social media, like everything, can easily be a distraction, from what we do. It seems, from what I can see, the folks who most typically foster that distraction, are those who are doing “well” with social media. It’s in their interest to get everyone focused on social media, simply because that enhances their own marketing efforts; whether it benefits those further down the pyramid is irrelevant to their noise. So make it about the art; whether you promote your work via social media or expensive ads in national magazines. That is exactly what I have observed while being on FB or G+, the very good photographers you actually do not find on FB or G+. I as well decided to use my time for my photography instead for all the social media. I really enjoyed your article about this. Have been talking about this topic with quite a few photogs friends. We all came to the same point, it brings maybe some good friends, which is great, but what else ? I met great people out there through G+ and even meet up with them where ever on earth. That is the nice side, the other side is, it is time consuming.